Essential features packed in a 1U footprint to deliver the key elements for file and print and single application workloads. Value, performance, flexible storage, enhanced management and superior serviceability makes the DL360e the 2P system right-sized for both SMB and enterprise customers. 6. Optical Disk Drive Bay 6. NOTE: Up to 2 processors supported. Performance/Energy Star Model configurations include two processors with 8 fans. NOTE: Turbo 2 indicates the maximum potential bin increments when using Intel® Turbo Boost Technology, with 8, 7, 6, 5, 4, 3, 2 and 1 cores active. NOTE: DDR3 speed is the maximum memory speed of the processor. Actual memory speed may depend on the quantity and type of DIMMs installed (options for 1600, 1333, 1066MHz). NOTE: HP memory from previous generation servers are not fully compatible with the HP ProLiant DL360e Gen8 Server. NOTE: Depending on the memory configuration and processor model, the memory speed may run at 1600MHz, 1333MHz, or 1066MHz. Please see Memory Population Table or the Online Memory Configuration Tool at: www.hp.com/go/ddr3memory-configurator. NOTE: Provides data transmission speeds up to 3Gb/s. NOTE: This option available with all 8SFF or 4LFF drive bay models. 4 LFF drive bays total with Optical drive bay. NOTE: HP ProLiant DL360e Gen8 server offers both SFF and LFF versions in CTO. The Optical Drive bay is available with both models. NOTE: Drive cage changes are not supported. NOTE: Mini-video connector requires Front Video Adapter Kit (PN 655915-B21). NOTE: HP ProLiant DL servers no longer ship standard with a 12-foot NEMA 5-15P to C13 power cord that connects to 110V US wall outlets in a home or office. ProLiant DL servers are primarily connected to power distribution units (PDUs) in data center racks and now ship standard with a PDU 6-foot C-14 to C13 power cord (A0K02A). If a user wishes to power a ProLiant DL server using a 110V receptacle (NEMA-15), the 6-foot NEMA 5-15 to C13 power cord must be ordered separately (AF556A). See Power Cords section for Worldwide Power Cord options. Power Specifications To review typical system power ratings use the HP Power Advisor which is available via the online tool located at URL: www.hp.com/go/hppoweradvisor. HP CS Platinum Plus power supplies are required when enabling HP's Power Discovery Services, a solution that creates an automated, energy-aware network between IT systems and facilities. This allows your company to reclaim millions of dollars in wasted power capacity and downtime costs across data centers. For more information on HP's Power Discovery Services, go to: www.hp.com/go/ipd. NOTE: The 80 PLUS program is a unique forum that unites electric utilities, the computer industry, and consumers in an effort to bring energy efficient technology solutions to the marketplace. 80 Plus independently tests power supply efficiency and publicly posts the results on www.80Plus.org. NOTE: Customers may separately purchase a redundant fan with the 661530-B21 option kit. Additional fans to support redundancy are also included in -B21 processor option kits when upgrading from a one processor to a two processor model. NOTE: For more information on HP's Certified and Supported ProLiant Servers for OS and Virtualization Software and latest listing of software drivers available for your server including how to purchase from HP, please visit our OS Support Site at: http://www.hp.com/go/ossupport and our driver download page http://www.hp.com/support/DL360eGen8. HP Service Pack for ProLiant (SPP) and HP Smart Update Manager (HP SUM) version 5 provide a new, comprehensive approach to firmware and system software maintenance. Together they provide better operating stability and ensure maximum uptime. The SPP will be updated at a predictable cadence, typically coinciding with new HP server hardware launches. By enabling all firmware to be updated online and integrating firmware and system software updates in one operation HP SUM and the SPP offer faster updates of individual servers and dramatically faster updates of entire BladeSystem enclosures. Further improving system uptime and stability is the fact that HP provides 12 months of support on each Service Pack for ProLiant. The user experience around HP SUM and the SPP has been improved in several ways, starting with the web download. A single web page provides access to a single download containing both the latest version of HP SUM version 5 and the latest SPP. Optional smaller subsets with only specific types of servers or specific operating systems are offered to save on download time. The HP SUM application has been re-written to provide a more straightforward, intuitive user interface that guides the user through the steps of discovery, analyses and update, providing comprehensive information on available updates, criticality and interdependencies. This information is also available in reports. By providing the option of multiple local or shared repositories which can be easily updated from hp.com, HP SUM provides the tools to optimize stability and consistency throughout the company. While HP SUM and the SPP will recommend the combinations of firmware and system software that HP has found to be the best practice, the application gives customers the flexibility to set their own specific baseline. HP Insight Management HP Insight Control HP Insight Control, a product option, delivers essential infrastructure management that can help save time and money by making it easy to deploy, migrate, monitor, remote control, and optimize your IT infrastructure through a single, simple management console. HP Insight Control also supports Location and Power Discovery Services to automate many configuration, asset tracking, and power management tasks to speed implementation and prevent downtime. For more information, see http://www.hp.com/go/insightcontrol. You can get the support you need by choosing from one of a number of service packaged solutions we have designed to address wider set of customer support needs. HP Technology Services meets business challenges with services offered in three support recommendations - Optimized Care, Standard Care, and Basic Care - available for each product group. Such support solutions enable customers to optimize technology operations, minimize risk and drive better business outcomes with easy-to-buy, easy-to-use scalable support recommendations for servers, storage, networking and software designed to meet your specific needs. All three service recommendations include support services from the broader portfolio of Foundation Care and Proactive Care services. Helps optimize your systems and delivers high levels of application availability through proactive service management and advanced technical response. A skilled Technical Manager will own your call and end to end until resolved, delivering a single point of contact for you. Helping you to resolve your hardware and software issues and minimizing downtime in your business critical environment. Provides problem resolution support across the stack of HW, firmware, and HP and 3rd party SW. In case the issue is with 3rd party SW, HP does known issue resolution. If HP cannot solve the issue, it will contact the third-party vendor and create a problem incident on your behalf. HP's Support Center Mobile App* allows you to resolve issues yourself or quickly connect to an agent for live support. Now, you can get access to personalized IT support anywhere, anytime. For ProLiant servers and storage systems, the services cover HP-branded hardware options qualified for the server, purchased at the same time or afterward, internal to the enclosure, as well as external monitors up to 22" and tower UPS products; these items will be covered at the same service level and for the same coverage period as the server unless the maximum supported lifetime and/or the maximum usage limitation has been exceeded. Coverage of the UPS battery is not included; standard warranty terms and conditions apply. The defective media retention service feature option applies only to Disk or eligible SSD/Flash Drives replaced by HP due to malfunction. It does not apply to any exchange of Disk or SSD/Flash Drives that have not failed. SSD/Flash Drives that are specified by HP as consumable parts and/or that have exceeded maximum supported lifetime and/or the maximum usage limit as set forth in the manufacturer's operating manual or the technical data sheet are not eligible for the defective media retention service feature option. NOTE: When the SAS FIO riser kit (PN 661387-B21) which includes HP Dynamic Smart Array B320i controller is installed in the server, the embedded Smart Array B120i controller is automatically disabled. In the absence of another storage controller or an expander backplane, drives operate in ACHI or Legacy mode. In these two modes, the drives are not part of a hardware RAID or a member of a logical drive. The Locate, Drive status, and Do not remove LEDs in the drive carrier are disabled. NOTE: Includes Rack Mounting Gen8 non-telescoping Friction Rail Kit which does not allow for in rack serviceability. The HP 1U Gen8 Cable Management Arm is not available when using Friction Rails. To assist in the installation of the server into the rack an optional installation tool is available by contacting your local services representative (p/n 695539-001). Caution: HP recommends that a minimum of two people is required for all Rack Server installations. Please refer to your installation instructions for proper tools and number of people to use for any installation. Warranty Server Warranty includes 3-Year Parts, 1-Year Labor, 1-Year Onsite support with next business day response. NOTE: Includes Rack Mounting Gen8 telescoping SFF Ball Bearing Rail Kit which does allow for in rack serviceability. Due to the size and weight of the server two people are required to install the server into the rack. The HP 1U Gen8 Cable Management Arm is optional. To assist in the installation of the server into the rack an optional installation tool is available by contacting your local services representative (p/n 695539-001). Caution: HP recommends that a minimum of two people is required for all Rack Server installations. Please refer to your installation instructions for proper tools and number of people to use for any installation. NOTE: Includes Rack Mounting Gen8 telescoping SFF Ball Bearing Rail Kit which does allow for in rack serviceability. Due to the size and weight of the server two people required to install the server into the rack. The HP 1U Gen8 Cable Management Arm is optional. To assist in the installation of the server into the rack an optional installation tool is available by contacting your local services representative (p/n 695539-001). Caution: HP recommends that a minimum of two people is required for all Rack Server installations. Please refer to your installation instructions for proper tools and number of people to use for any installation. NOTE: Rail kits and cable management solutions are optional in CTO. See "Step 3: Choose Additional Factory Integratable Options" for details on ordering. NOTE: The DL360e ships standard with the HP Dynamic Smart Array B120i Controller which provides support for up to 6 SATA drives (greater than 4 drives requires additional cable, PN 675856-B21) and data transmission speeds up to 3Gb/s. Customers requiring SAS support or greater than 6 drives should select either a Smart Array family controller or the SAS Riser FIO kit (PN 661387-B21) that includes HP Dynamic Smart Array B320i Controller Up to 8 SAS drives can be supported with HP Dynamic Smart Array B320i controller. NOTE: When the SAS-enabled riser board with the Smart Array B320i controller is installed in the server, the embedded Smart Array B120i controller is automatically disabled. In the absence of another storage controller or an expander backplane, drives operate in ACHI or Legacy mode. In these two modes, the drives are not part of a hardware RAID or a member of a logical drive. 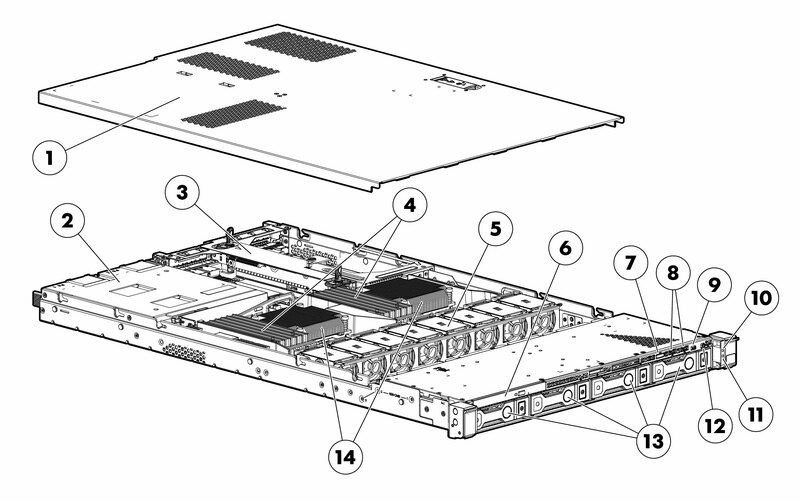 The Locate, Drive status, and Do not remove LEDs in the drive carrier are disabled. NOTE: Power Supply not included - choose from Power Options section. NOTE: HP Smart Array P222 Controller and HP H222 Host Bus Adapter can be selected with only 4LFF models. NOTE: New options are available for Rack Rail Kits; these options are no longer standard on-board with this Model Part Number. Please see HP Rack Options below for optional required options. NOTE: HP memory from previous generation servers are not fully compatible with new Active Health features on the Gen8 Server. NOTE: SAS license key (PN BC393A) is selected by default when this riser kit is selected. If SAS support is not needed, SAS license key (PN BC393A) can be deselected. SAS license key is mandatory for SAS support. Supports up to 8 drives. NOTE: If no other storage controller is selected, embedded HP Dynamic Smart Array B120i controller (SATA only) is the primary controller. HP Rack Kits NOTE: Gen8 rail kits have changed significantly from prior generation rail kits. Please take a moment to review the installation documentation that comes with the server to help you with the installation of your Gen8 server. NOTE: Includes Rack Mounting Gen8 non-telescoping Friction Rail Kit which does not allow for in rack serviceability. The HP 1U Gen8 Cable Management Arm is not available when using Friction Rails. To assist in the installation of the server into the rack an optional installation tool is available by contacting your local services representative (p/n 695539-001). HP Hard Drives NOTE: The HP ProLiant Gen8 Smart Storage solutions are equipped with entirely re-designed Small Form Factor (SFF 2.5 in) and Large Form Factor (LFF 3.5 in) hot plug carriers for HP Qualified Hard Drives and Solid State Drives. These new carriers provide status and activity indicators as well as caution indicators for "Do Not Remove". NOTE: Required to enable the front video port. (example: graphics cards) that require up to 225W of power. NOTE: For additional license kits please see the QuickSpecs at: http://h18004.www1.hp.com/products/quickspecs/12612_div/12612_div.html. NOTE: The TPM (Trusted Platform Module) is a microcontroller chip that can securely store artifacts used to authenticate the server platform. These artifacts can include passwords, certificates and encryption keys. Windows® BitLocker? Drive Encryption (BitLocker) is a data protection feature available in Windows Server® 2008. BitLocker leverages the enhanced security capabilities of a Trusted Platform Module (TPM) version 1.2. The TPM works with BitLocker to help protect user data and to ensure that a server running Windows Server 2008 has not been tampered with while the system was offline. For more information about TPM, including a white paper, go to: www.hp.com/go/TPM. NOTE: This cable kit is required when using the P222, P420, P822 Smart Array controllers, and H222, H220 HBAs. NOTE: If P420 is installed in Slot 1 of 8SFF model, this cable is not required. NOTE: Required for SAS support if HP Dynamic Smart Array B320i (PN: 661387-B21) is the primary controller. NOTE: The HP 1U Gen8 Cable Management Arm is not available when using Friction Rails. To assist in the installation of the server into the rack an optional installation tool is available by contacting your local services representative (p/n 695539-001). Caution: HP recommends that a minimum of two people are required for all Rack Server installations. Please refer to your installation instructions for proper tools and number of people to use for any installation. NOTE: Hardware break/fix plus 24x7 software diagnosis support with collaborative call management for a broad spectrum of 3rd Party software products including O/S and hypervisors. Recommended for customers procuring 3rd party SW O/S and hypervisors from the software vendors directly and deploying them on HP ProLiant servers. server. Up to 32GB capacity DIMMs are supported for 384GB of max memory . Do not mix UDIMMs, RDIMMs or LRDIMMs. NOTE: To realize the performance memory capabilities listed above HP SmartMemory is required. **LRDIMM enables 2 DIMMs per channel. HP SmartMemory supports up to 2DPC@1333 at 1.35V. Third party memory may only support up to 2DPC@1066 at 1.5V. *** For UDIMMs, HP SmartMemory supports 2DPC@1333 at 1.35V. Third party memory may only support up to 2DPC@1066 at 1.5V. Population order; looking from the front of your server CPU#1 is on right side and CPU#2 is on the left. See the population order by alphabetic and numeric progression below. NOTE: HP memory from previous generation servers are not fully compatible with the DL360e Gen8 Server. System Inlet Temperature Operating 10° to 35°C (50° to 95°F) at sea level with an altitude derating of 1.0°C per every 304.8 m (1.8°F per every 1000 ft) above sea level to a maximum of 3048 m (10,000 ft), no direct sustained sunlight. Maximum rate of change is 10°C/hr (18°F/hr). The upper limit may be limited by the type and number of options installed. NOTE: Values are subject to change without notification and are for reference only. NOTE: Performance of system, options, and ancillary equipment will vary depending on the system configuration. NOTE: Levels presented do not account for non-Hewlett-Packard installed hardware. NOTE: 512 MB cache is required to enable RAID 5 support.